By now, the notoriety Lay Lake received in years past, has shown this can be one of the states most popular lakes for Bass tournaments, and rightfully so. Major bass tournament trails, annual events and charitable organizations hold their tournaments here each Spring. The Bassmasters Classic was held on Lay Lake in 1996 with George Cochran winning with a very low weight for Lay Lake. It was held again and featured on Lay Lake in July, 2002. Again, held out of Paradise Point Marina at mid lake. By now you know Jay Yelas won that event fishing all 3 days in the Lakes headwaters and he took big bass all three days of that world famous event for the first time in Classic history. Hundreds of bass were caught and released back then, and many bass are released now each week, in major tournaments such as this. In 2007 Alabama’s Boyd Duckett won the Bassmaster Classic on Lay lake. In 2010 Michigan’s Kevin Van Dam won the Bassmaster Classic on Lay lake. 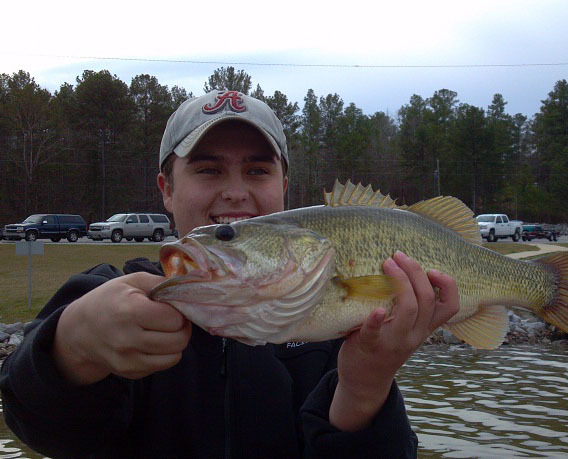 Five bass limits (so common in most Lay lake bass tournaments) have already shown 20 lb. plus bags of bass brought to the scales this year. Bags of spotted bass averaging 3-4 lbs are a common sight at these weigh-ins. Mixed bags of both spotted bass and largemouth bass always include a few big largemouth’s weighing from 5-7 lbs each week. Even in small, wintertime wildcat tournaments, such as those held out of Paradise Point Marina, 30-50 boats participate. The winning weight, can predictably, be from 15-20 pounds. “The Lay Lake Tournament” held by Marks Outdoors Sports out of Vestavia in Birmingham (www.marksoutdoors.com) has drawn a huge crowd for over 10 years straight. It is now limited to 500 boats. Each year in the spring, Mark’s Outdoors Sports tournament have contributed thousands of newborn fingerling bass, with over one million bass now stocked in Lay Lake by this bass tournament alone. Sure would be nice if all the people that ran bass tournaments did that! So, what’s the secret to this enormous bass fishery ? Its no secret. The weeds. Lay Lake is at full pool year-round. Two lower Coosa River Impoundment’s, Mitchell Lake and Jordan Lake, are also at full pool year round. 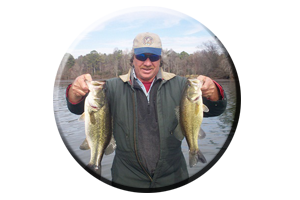 All three of these lower Coosa River Impoundment’s, show bass inhabiting the many miles of various types of aquatic weeds, lining each lakes shorelines, producing excellent fishing year-round. The weeds that make up Lay Lake are homes to most of the lakes bass population, on a year-round basis. During March many weeds are still dormant, so looking for the greenest, newest-growing weeds, can start your search in some very productive prespawn spots. That is, with a little patience and a lot of searching. Feeder creeks along the Lakes eastern shorelines, are mostly wind-protected and display sun-drenched banks. These banks will show significant weed growth, over other less significant areas, during the first few weeks of March. Thin stands of weeds deserve several casts with various lures, from many angles, with a variety of lure presentations. Keep in mind these are very spooky bass. Some bass are entering the shallows for the first time in months. Stealth and long casts, are needed, to sneak up on unsuspecting bass. Many spring time lunker bass, are now lying in some very shallow water. Fan-casting first and secondary weedy points, will target prespawners during March on Lay lake. Stumps, brush, laying logs and other wood cover, in or near weedy spawning grounds, now hold some BIG dominant bass. This isolated cover, within the weedy cover, is usually dominated by the bigger bass in that particular area. Each individual piece of cover, deserves many casts. Flipping or Pitching is a Big bass tactic on Lay Lake. This, in close technique, can be utilized around wood cover or while fishing in and around thick, matted weeds. In years past, the jig and pork (or plastic trailer) combo has been responsible for many tournament wins and often for fooling the Big Bass of the day. 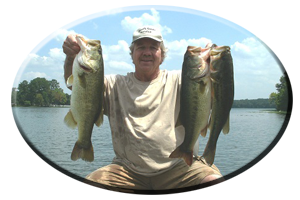 The jig combo still produces Big Bass and Big bags of bass, each week, year round, on Lay Lake. “Swimming a jig” has become a well known tactic (often known in the winners circles), a lure that fools these highly pressured bass of Lay lake. Nowadays lure-accustomed bass are being fooled with a new “look” of modern day lures. Lures such as gitzits, grubs, tube baits, twin tails, swim baits, lizards, plastic crayfish and worms of all shapes and sizes. Creature baits, lures featuring several legs or trailing appendages, and a variety of worms and shad imitations have changed tremendously over the past few years. Many of these new soft plastic creations, are winning major tournaments on Lay Lakes weed-infested waters. 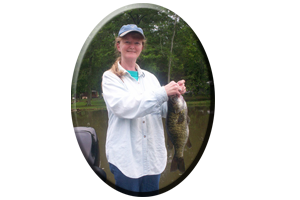 To be successful when using these flipping and pitching presentations, look for, thick cover, lightly stained water, warm water and plenty of baitfish activity, during the month of March and on into April on Lay Lake. As lake waters warm into the 70′s, spawning bass will seem to be in every patch of weeds you fish. As April gets underway, bass will spawn lake wide, with some female bass already in a post-spawn mode, by the months end. Weedless lures are very productive in April on Lay Lake especially in thick, matted weeds, where the bigger bass like to hang. Fishing along these weedy edges, around weedy points, weed patches and in small openings within the weeds, calls for the use of a variety of lures. Lures such as frogs, rats, soft plastic jerkbaits, floating worms, lizards and buzzbaits, will eventually anger these huge largemouth bass into striking. Several cast’s to one spot, may be needed to entice a strike from these lure-conscience bass. Many tournaments are held in April. 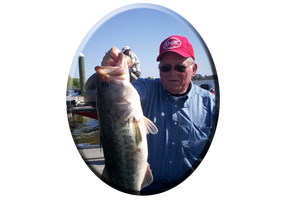 Release sights, such as Paradise Point Marina on Lay Lake, has small pockets lined with weeds and loaded with bass. Many bass released in major bass tournaments, stick around to feed, spawn and recuperate. That is as long as conditions are right and baitfish are present. For weeks at a time they are still very catchable bass. As bass come off the beds in May, Lay lakes weeds will be in full growth. Some weeds are very thick and deserve many casts in and along weed edges, with weedless lures, and even, not-so-weedless lures. Topwater explosions are nerve racking, especially when followed with no hook up. Its usually the biggest bass in the lake (or so it seems). These missed strikes can be eliminated, if you ready yourself for the strike. Sharpen or replace hooks, and most importantly, make long casts, past your intended target, to avoid spooking the bass. Weed edges hold recuperating post-spawn bass awaiting an easy meal. Its up to you to make your offerings as enticing as it gets, to appeal to these bass that often won’t move far, even for an easy meal. Lures with dangling treble hooks, are not for casting up in the weeds and only lead to frustration, hang-ups and lost lures, that can get expensive. With a little accuracy, lures such as Pradco’s Zara Super Spook (with 9 exposed hooks), can be maneuvered between weed patches, along both sides of weedy points and down small, narrow lanes, within the weeds. Topwater lures like, Pop-r’s, the Spittin’ Image, Baby Torpedoes, and loads of soft plastics, all offer many choices for spring. Go to www.fishingalabama.com and click on, “Links” to find these sponsors. Goo* Looking for a new or used boat?